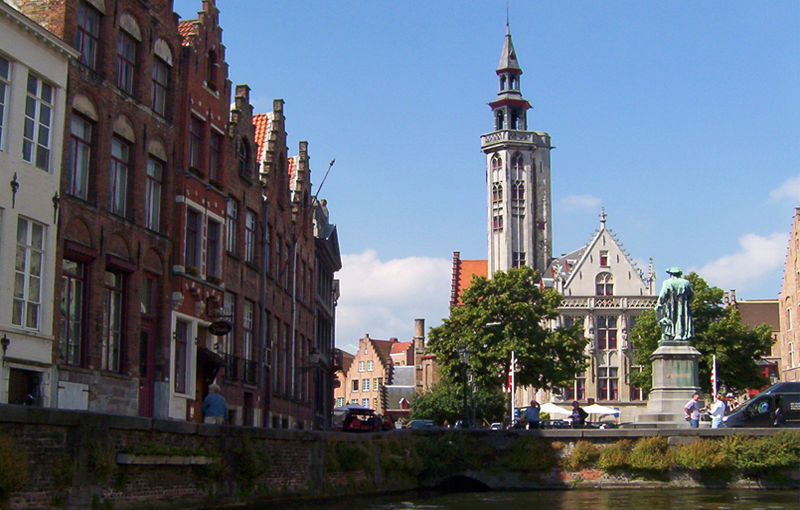 In the eleventh century Bruges was a major commercial centre for the wood industry, and by the late thirteenth century was the main link to Mediterranean trade. It soon became a major financial centre too, and in 1309 the Bourse opened, making the city more sophisticated money market in the entire region. By the sixteenth century, however, Bruges had split from the Netherlands and the port of Antwerp had taken over much of its trade, leaving Bruges to decline into a provincial backwater. There is much fine art and architecture to see in Bruges. The Church of Our Lady (Onze Lieve Vrouwekerk) boasts the highest brick spire in Europe and contains a sculpture of the Madonna by Michelangelo. The Basilica of the Holy Blood (Heilig Bloed Basiliek) is another famous church that displays a phial said to contain the blood of Christ. The Groeninge Museum contains paintings from six centuries, including works by Hans Memling and Jan Van Eyck, who lived and worked here. If you tire to cultural sightseeing, take a trip on a canal or just sit in a pretty, peaceful spot and try one of the 350 or more beers. For me it is the most beautiful village in Europe. Small but perfect.